Happy New Year! The past year has been busy and challenging and has marked the introduction of our first reproduction solar lamp. Already, the production schedule is filling up for the first part of this New Year. An order for an oil-burning Argand Annular Chandelier means that both it and the Argand Student Lamp will finally be available both electrified and oil-burning by early spring. 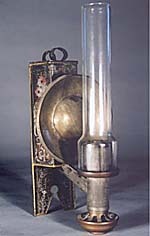 Interest in the Argand side lamp by both a prominent gallery owner and a museum in New York City will spur development of this lamp. The National Park Service has expressed an interest in a solar harp chandelier so work on it will be moved to the front burner as well. The Argand three- and four-burner chandeliers have not been forgotten. A photograph and drawing of the originals that will be reproduced are pictured below. As I mentioned in the last newsletter, a firm order will move placement of a particular lamp up toward the top of the development and production schedule, so please get in touch if either of these chandeliers are of particular interest. 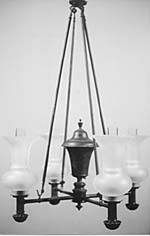 Several people have called asking if I have plans to reproduce any of the single- and double-light Argand mantel lamps. The answer is yes and I look forward to starting work on them as soon as possible. Eventually I would also like to reproduce several sinumbra table lamps and chandeliers. The major snag here is availability of the shades. I would greatly appreciate hearing from any of you who might have any leads or information in regard to availability of good quality reproduction sinumbra shades and people or firms engaged in glass mold making, blowing, and decorative design cutting. I will be working on correcting the temperature of the light emitted by the electrified reproduction lamps to that of oil-burning lamps. This, along with the fact that the light source on my reproduction lamps is in the correct physical position over the burner, will result in an electrified lamp that corresponds to the original oil-burning counterpart as closely as possible. Left to right: Argand side lamp, Argand four-burner chandelier, Argand three-burner chandelier, solar harp chandelier. The Argand side lamp and four-burner chandelier are owned by Don Carpentier of Eastfield Village, East Nassau, NY. Gerald T. Gowitt granted permission to copy the drawing of the solar harp chandelier from his book, 19th Century Elegant Lighting - Argand, Sinumbra, and Solar Lamps (bottom right, page 107). It is the No. 5 Brass Harp Oil Hanging Lamp as it appeared in the 1856 Starr, Fellows & Sons Illustrated Catalog. I will be exhibiting at the March 2003 Restoration and Renovation show in Baltimore, Maryland (show highlights are noted below); a detailed brochure that also serves as a complimentary free admissions ticket is enclosed and I look forward to meeting those of you who will be able to attend. Dates for other shows will be posted on the website as soon as they are finalized. If you know someone who would be interested in receiving this and future issues of this newsletter, I would appreciate it if you would either forward their name and address to me or give them my contact information so they can get in touch with me. A few people who are no longer interested in Argand and solar lighting sent cards asking to be removed from the mailing list. They inadvertently neglected to include their names and so, of course, it has not been possible to delete them. If they will notify me again I will be happy to comply with their requests. And finally, if in your travels you should be coming through Central New York State, you are more than welcome to visit the workshop. It is located in the town of Westmoreland less than one mile from Westmoreland Exit #32 of the New York State Thruway (Interstate 90) and just 10 miles west of Utica and 40 miles east of Syracuse. Be sure to call before stopping to make sure that I will be in. As always, it will be a pleasure to hear from you with your thoughts, comments, questions, and suggestions. P.S. Please note that our e-mail address will have changed from jptinsmith@mybizz.net to jptinsmith@adelphia.net by the time you receive this newsletter. There is no admission charge if you are attending the show to peruse the numerous exhibits, however, there is a charge for the various workshops and conferences. Below I have noted pertinent show highlights and a few notes regarding registration. If you have any questions regarding the show call Restoration and Renovation directly at 1.800.982.6247. Registration: You can also register on the Restoration and Renovation website at http://www.restorationandrenovation.com.